This is, I believe, the Ace kit in a Siga box. I'm not sure what the relationship between the two companies is but I hope it's an agreeable one, and not a case of somebody copying somebody else's work without their permission. The Siga release has different markings options than the Ace kit, and it was the Finnish version with its distinctive splinter camo that attracted me. 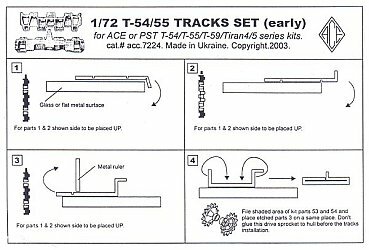 I wasn't too happy with the tracks included in the kit which are quite thick and lack detail on the inside so I decided to use Ace's p/e track set, set number 7224. I also struggled getting the kit wheels and gun barrel to look good so I figured I may as well replace those while I was at it. I used a resin wheel set from MR Models and an Armo turned aluminium barrel. In addition, tow cables from Eureka XXL were utilized. More on these later. 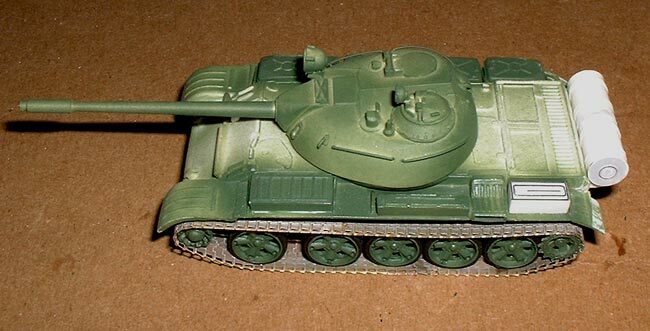 My usual method for armour is to build and paint the running gear then add the upper hull, take care of any seams, paint the upper hull and then add the tracks. This has always worked for me, or at least it did until I decided to give photo etched tracks a try for the first time. I figured I'd be able to just slide the tracks in place between the wheels and fenders, wrap them around the drive and idler wheels and then join them on the bottom without any trouble. One completely destroyed set of tracks and several broken off wheels later however, I realized there was no way these puppies were going in without tearing the upper hull off and starting again. Despite already going back in the box countless times in frustration and spending several years sitting around mocking me, I plucked up the courage to rip and tear and once more pulled it out from under the workbench. Resistance was futile. I purchased a second set of tracks and started again. 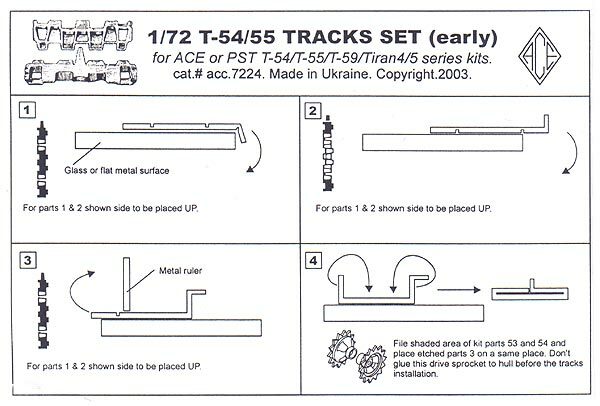 The tracks come in two sections each. These were folded into shape and then annealed by heating them over a gas flame and allowing them to cool naturally. This is absolutely essential as it makes them soft and pliable and takes all the springiness out which means they'll bend easily and stay tightly wrapped around the wheels. 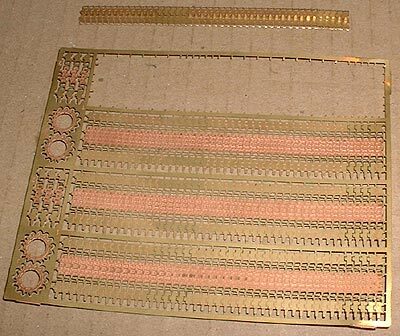 To ensure a good strong bond between each piece, a small section of .005" brass sheet was inserted into each end and soldered in place after cutting the tracks to the proper length. 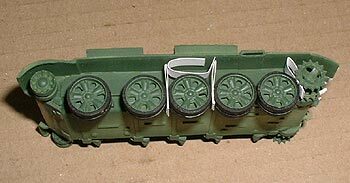 Without the upper hull in place it was far easier to wrap the tracks around the wheels and glue them in place and the whole operation was quite painless - except on my wallet as p/e tracks are not cheap and I bought two sets! 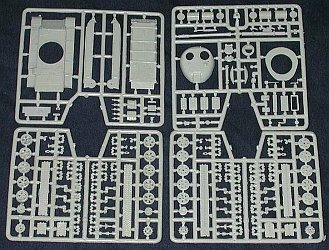 I should also mention that these are the early version, more like T-34 tracks, which I don't think are appropriate for Finnish T-55s. They are also a bit too thin I think. Nonetheless, they are a vast improvement over the kit tracks (which are also early ones anyway) and I could live with the inaccuracy. With the tracks finally in place, the upper hull back on and the damage from separating it repaired, the rest of the build went fairly quickly and easily. 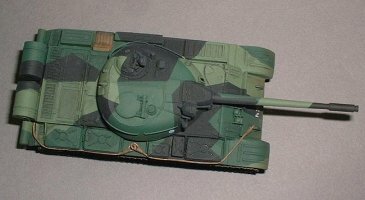 I have to admit I couldn't find a single photo of Finnish T-55s with the rear fuel drums in place, though several had the mounts for them. 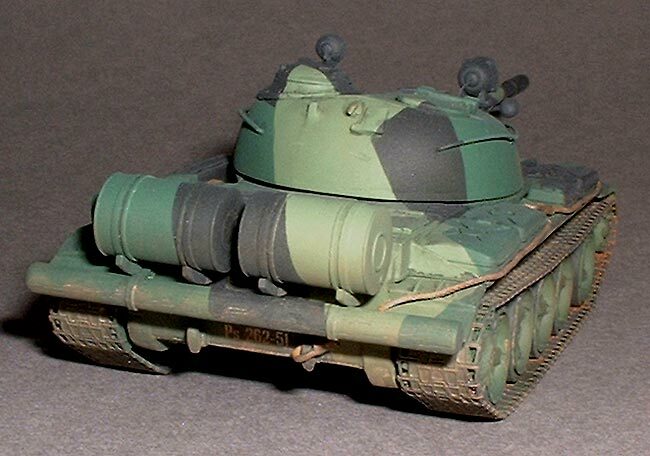 I like the look of them so decided to add them anyway, but thought that scratch building the drums would ultimately be easier and produce a better result than trying to clean up the multi-part kit tanks. 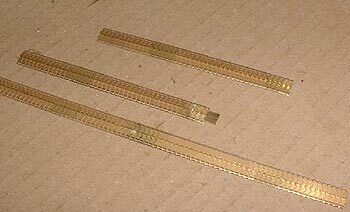 Using Evergreen 5/16" o/d styrene tubing, strip stock for the reinforcing bands and mounting straps and .005" sheet for the ends I managed to produce a couple of reasonable facsimiles. These were painted separately before adding them at the end of the build. The fuel tanks on the side were poorly moulded and suffered from sink marks so these were sanded flat on the sides to clean them up and the raised seams were reinstated from stretched sprue. 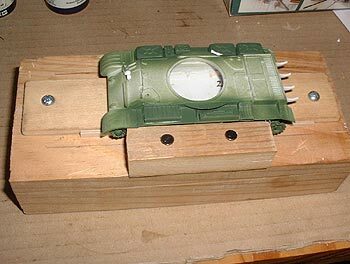 The unditching beam was replaced with a piece of 1/8" wooden dowel with the straps from strips of .005" plastic sheet. The Eureka XXL tow cables consist of two soft copper braided cables and four resin ends. This is the first time I had tried them, though I have several sets in my possession. 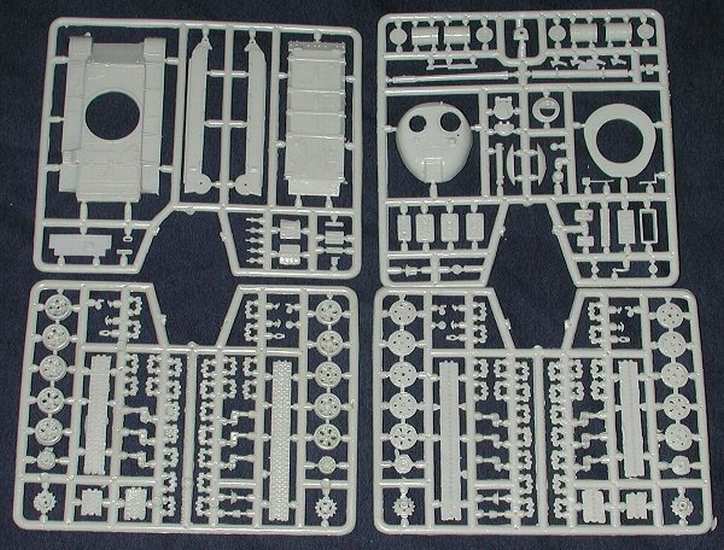 Each set is for a specific AFV and has the appropriate resin tow hooks for the intended vehicle included plus enough braided cable for one model. The soft cable made them a breeze to bend and position and I was very pleased at how they looked once painted and weathered. I will definitely be using more of these in future. When it came time to paint I was in a bit of a conundrum about which colours to use. 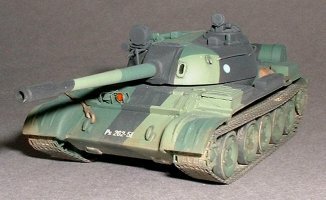 I came across a painting guide on the IPMS Finland website (at least I think it was, but I can't find it there now) which recommended Humbrol 102 for the dark green and 10 parts HU75 + 6 parts HU131 for the light green. This produced two colours which were virtually identical to each other however. I had seen other interpretations on various modelling sites but in the end I decided to try and approximate the colours I saw in various pics of real Finnish armour. For the dark green I used HU149 straight out of the tin and for the light green a 50/50 mix of HU102 Army Green and HU120 Light Green. It may not be totally correct, but it looks pretty close to me. The black is, strangely enough, black, though the final finish of Polyscale clear flat makes it look dark grey in the photos. 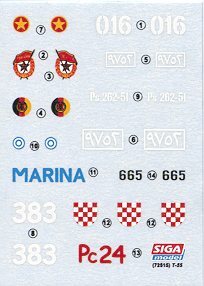 Decals consisted of two identification numbers for the front and rear of the hull and two small national insignia for the turret sides. These went on very well and the carrier film completely disappeared after an application of Micro Sol. Well, it was a test of patience and I thought it would never get done, but I'm happy with the end result. 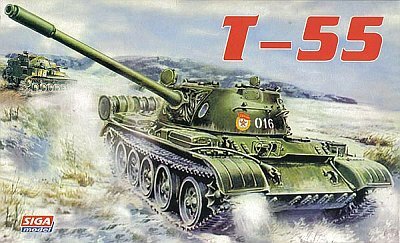 The Siga/Ace kit is really quite nice, despite the limited run nature, and builds up into a nice representation of the T-55. The problems I had in no way reflect on the kit or even the p/e tracks for that matter, it was mainly my lack of experience with the latter that caused me grief.